I’ve been doing a lot of networking since starting my business, and it’s been a good experience for me. I’ve managed to gain a good number of clients and referrals through attending these events. I’ve also gained a lot of useful information for my business. I’ve also discovered services that I’ve later used for both my business and personal life. 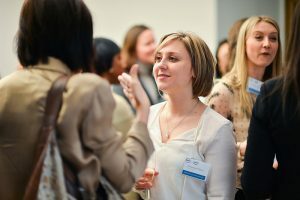 So I’d like to share a few tips on how to make the most of going to networking events. Try to arrive at least 15 minutes before the event starts, especially if it’s either your first time at a particular event, or it’s one that you know will be very busy. If you arrive and there are only a few people to start talking to, it’s much easier than turning up to an overwhelming crowded room and not knowing where to start. Business cards are pretty much vital! It makes it easy to quickly swap contact and business details with people. They also make you look professional. Plus, at some networking events (ones that are not too large), everyone sits in a circle and passes their business cards around. If you’re without business cards then you’re missing out on a lot of marketing opportunity! A couple of printing companies I like using are Vistaprint for cheapness and Moo for quality and options. Not as vital, but flyers, leaflets and information sheets can also be useful to take along. Particularly for businesses that need a bit of explanation about what they do that won’t necessarily fit on to a business card. For example,not everyone is very familiar with my profession as a virtual assistant, so I have my own flyers and info sheets that I give out to describe and explain my business services. If there is a table at the event for putting sales literature on, then put them there. Otherwise, pass them around in the same way you would with business cards. I like Solopress for flyers. Concentrate on quality, not quantity, when it comes to who you talk to. Networking is not just about meeting people and marketing your business, but it’s also about building relationships. It will be impossible to properly talk to everyone in some networking events anyway if there are so many people. So focus on making a lasting impression on 3 to 4 people, rather than making a fleeting impression on 20 people. Unless you’re the keynote speaker, don’t just make a conversation with someone all “me me me”. Show interest in what they do and ask questions about them. This helps with building relationships. It can also be useful for thinking up tips and advice on how you could help them. After all, people often like to do business with who they know and like, so get them to like you! Whether you carry a notebook or use your mobile phone, you want to always be prepared to take notes. You never know when someone might tell you some useful info that you won’t want to forget. You might also want to make notes of things for your follow-up messages. Don’t forget to follow up with the people you chatted with. Send them a short email or personalised LinkedIn request saying that it was great to meet them at the event and that you’d like to keep in touch. Reference things you talked about, if appropriate, especially if it’s something that will benefit them. Let them know a little about how you could help them, but try not to make it too sales-y or off-putting. Remember, they already know how to access your website and information, so focus on nurturing connections. You might also decide to arrange one-to-one meetings with certain people who might be particularly useful to you, to find out more about them. I hope you enjoyed reading my blog post. Feel free to comment what you think. Also, check out my other blog posts on where to network within Edinburgh: Part 1 and Part 2. And if you are in the Edinburgh area, let’s meet up and go networking together! My email is toks@tavaservices.co.uk and phone number is 07806449148.